The problem with Chabrier's operas is that the two best ones (L'Etoile and Le Roi malgre lui) have superb music attached to frothy, almost inconsequential librettos, which leaves modern commentators and directors dissatisfied that the librettos do not match the quality of the plot. That this sees to have been deliberate on Chabrier's part is no help; he seems to have been interested in providing sophisticated music for the essentially boulevard theatre, Offenbach's Théâtre des Bouffes Parisiens, where L'Etoile was premiered. 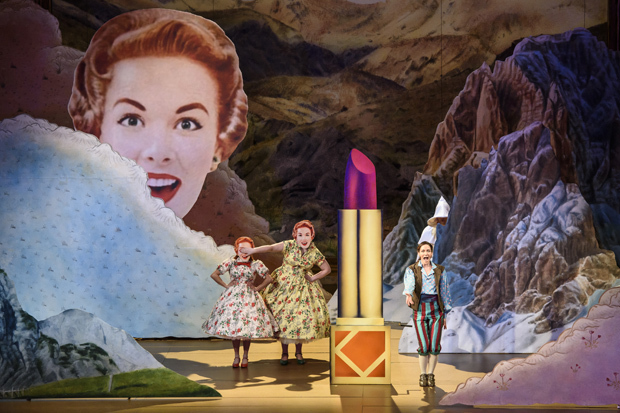 Covent Garden's new production of Chabrier's L'Etoile (the house's first production of any Chabrier opera) premiered on Monday 1 February and we caught the performance on 5 February 2016. The production was directed by the French director, Mariame Clement, with designs by Julia Hansen, lighting by Jon Clark, and choreography by Mathieu Guilhaumon. 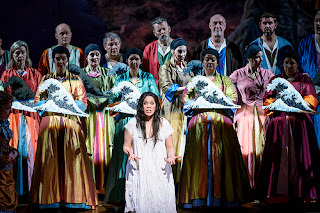 Mark Elder conducted, with a cast including Christophe Mortagne, Simon Bailey, Francois Piolino, Aimery Lefèvre, Kate Lindsey, Hélène Guilmette, Julie Boulianne, Chris Addison and Jean-Luc Vincent. In presenting L'Etoile at Covent Garden, an element of transcription and translation was inevitable. 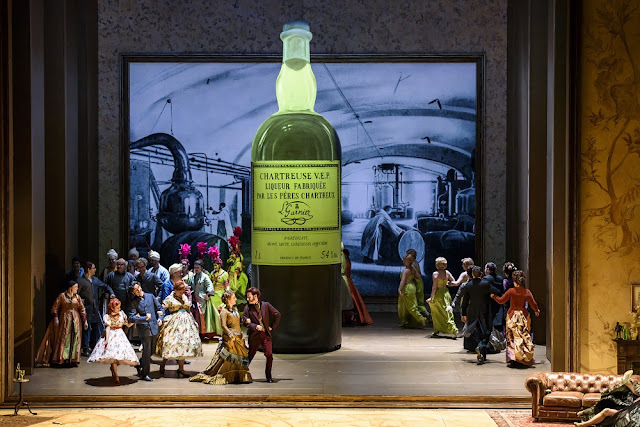 An opera bouffe with significant amounts of comic French dialogue, designed for a tiny theatre can hardly be put on in a theatre the size of Covent Garden to a largely non-French-speaking audience without something being changed. That director Mariame Clement saw this as a problem is indicated by the fact that much of the original dialogue was removed, and replaced by extra dialogue (created by Mariame Clement, Chris Addison and Jean-Luc Vincent) for two extra characters, an Englishman and a Frenchman (Chris Addison and Jean-Luc Vincent) who formed an extra layer commentating on and getting involved with the opera (and at a couple of points stopping the action and stepping firmly out from behind the proscenium). I am not entirely sure that this was necessary, and I understand that when New Sussex Opera performed L'Etoile a few years ago they successfully did so without major interference with the text, but they perform in rather smaller venues. 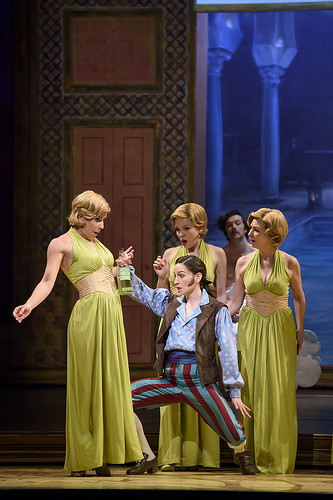 Perhaps the solution might have been to perform the opera in English, but recent attempts to do this such as ENO's importation of Laurent Pelly's production of Offenbach La belle Helene, have not escaped the dead hand of G&S. Not that there is anything wrong with G&S, but it is simply the wrong model when trying to adapt French operetta to the English stage. As it was, Covent Garden had engaged an admirably Francophone cast and the results were incredibly stylish. Would that we could have such a sense of correct style in performances of Bizet's Carmen! The plot is ludicrously inconsequential to the point of surrealism, and Clement and her designer Julia Hansen picked up on this to a large degree. The production was surrealistic in the extreme, with characters arriving by hot air balloon, a vast cutout of a 1950's style female face appearing from behind the mountains (also cut out) at key moments, and the famous duet about green Chartreuse taking place inside a bottle of the said liqueur. Over the top, yes, a bit too much, perhaps, but very funny and it never felt added on. The laughter always went with the flow of the performance, so that though I went prepared to get annoyed and dislike the liberties taken, I came away with a real smile on my face. The plot is so crazy that it hardly bears summarising. Lazuli (Kate Lindsey) is a pedlar who has fallen in love with an unknown woman, she is Princess Laula (Hélène Guilmette) who has come to the country with a diplomatic party, ambassador Prince Hérisson de Porc-Epic (François Piolino), the ambassador's secretary Tapioca (Aimery Lefèvre), the ambassador's wife Aloès (Julie Boulianne). Laoula will be marrying King Ouf (Christophe Mortagne), but her party as come to the country in disguise pretending to be staff for the department store. Despite the notional Eastern setting, the libretto mocks modern fads such as the recently opened department stores. There is much confused identity, Lazuli is condemned to be executed by King Ouf but the court astrologer Sciroco (Simon Bailey) announces that Lazuli and Ouf's destinies are linked and if Lazuli dies so does Ouf. But all this is simply a frame on which to hang some lovely, sophisticated and entirely delightful melodies. Some of the numbers, such as Mortagne and Bailey's duet to chartreuse, are entirely lacking in dramatic consequence but that does not matter, whilst others such as the ensemble where the chorus urges Lazuli to sit down (on the impaling chair) have a melodic felicity and complexity which is remarkable. It was Kate Lindsey's Lazuli who put the real heart into the piece, her solos particularly the one to her little star, gave the plot some real emotional depth. Not only did Lindsey prove herself a fine comedian, but she sang stylishly and made us really care for the young man. Christophe Mortagne brought a real tang to King Ouf's music, performing his solos with a sense of French style and vocal emission that it is rare to hear on the English stage. The way he combined a sense of the text with the music was a complete and utter delight. Princess Laoula and her party Hélène Guilmette, Francois Piolino, Aimery Lefèvre, Julie Boulianne almost formed a comic quartet such was their sense of interaction and playing off each other. Hélène Guilmette's Laoula did not get much in the way of big solo moments, but her duet with Julie Boulianne when the two tickle Lazuli awake (here changed to something more obviously suggestive today) was delightful. And the way Julie Boulianne and Aimery Lefèvre made their characters (he is her husband's secretary) obsession with each other into a running gag was great fun. Francois Piolino was a superb comic turn as the ambassador (his name translates as Hedgehog of Porcupine). Simon Bailey was nicely comic as Siroco though the part is a bit under written. The striking designs played up the multi-layered nature of the plot. The fore-stage was a 19th century drawing room (where Chris Addison and Jean-Luc Vincent's character's lived) with the real wall a huge Persian miniature which came alive in the opening chorus and behind which most of the action took place, though of course this spilled forward. The only drawback was that moments like Kate Lindsey's luck star solo ended up placing the singer too far up stage and you wanted her to be as close as possible to the audience. The smaller roles were all well taken with Samuel Sakker as Patacha, and Samuel Dale Johnson as Zalzal. Mark Elder conducted a stylish, if inevitably big-boned account of the score (the orchestra was far larger than the two dozen or so players that Chabrier would have experience), but they brought Chabrier's complex and charming music alive. But here, as with much else of the performance everyone seemed to be trying too hard, and that what the piece wanted was for all concerned to relax and accept that this is a piece of stylish froth and not be so earnest about it.